Silverfish are a wingless insect easily recognized by their three prong-like appendages that protrude from their ‘tail’. They are generally light gray to silver in color and can grow in excess of ½ inch in size. While silverfish are primarily a nuisance pest, they will eat cellulose products—primarily paper—glues made of natural products, and various fabrics such as rayon, artificial silk, and cotton. They can be quite destructive over the long term to stored items such as books and archived papers. 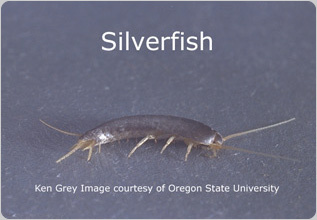 In Northwest structures, a common silverfish species is the fourlined silverfish (Lepisma saccharina), which is less restrictive in their territory to other species of silverfish that prefer warm, moist conditions for survival. The fourlined silverfish typically will be found in attics (especially if the home has a cedar shingle roof), ceilings and skylights (especially in moist areas such as kitchens and bathrooms), garages and basements. Outdoors, they prefer living in mulch and shrubbery beds. Corrective measures: Control is often dependent upon modifying the existing moisture conditions inside. Proper ventilation, both in the crawl space and the attic, to reduce the humidity can help. Items that may be attacked by silverfish may need to be stored in drier locations to reduce the food source for them. In infested homes with shake roofs, it may be necessary to consider professional treatment services to reduce the immediate populations of silverfish, especially in crawl spaces and attics. In some extreme cases, especially when shake roofs have exceeded their useful life, replacing the roof with non-wood based materials has simultaneously eliminated the silverfish issues. Leupitz Pest Control has had good success in provide service programs to manage silverfish populations in structures. Feel free to call us for answers and assistance with these pests.